Do You Want a Job? Or Do You Want to Be Your Own Boss? I just read that the people in Congress have already passed, or are looking to pass, an $825 Billion stimulus package. The stimulus will focus on JOBS. If you are out of work right now - or if you are on "shaky" ground with your current position - I truly hope and pray that you get a good, decent JOB quicker than a cat on a mouse. However, if you are tired of a JOB and want to be your own boss, to call your own shots, you deserve to check out all your other opportunities. You deserve to check out freight brokering and there is no better material presented to you BEFORE you commit than our own website, our blog, our freebies, and our other low-cost items. Since my Freight Broker Training business is internet-based, I have to do a lot of work in finding how to reach as many people with as little time, effort and cost as possible. It's not easy but it's enjoyable - for the most part. As with any type of "search", things can get frustrating especially if you can't find enough quality information. I say "quality" because after all the "fluff" you need to be provided not only the "benefits" of what you are investigating but also the "features". You want to know just what the heck you would be buying. Every day I get emails sent to me (usually by some type of invitation) and the cost of what they are selling might run anywhere from $13.97 (like today) to over $50,000. Naturally, I'm looking more for something inbetween because with a cheap product there are usually more solicitations for more expensive options. And with a real expensive product, I'm just not quite ready to shell out $50,000. This is why I try to give a full disclosure on my website. Yes, that means you need to read more information and that means you need to spend more time evaluating and comparing my information to whatever else is out there. But for those who take the time and effort to read the whole enchilada, they get a pretty good idea about what is available from us and how much it costs. At this time in our shaky economy (that's putting it nicely), you can still start a new business. In fact, many people WILL start a new venture and they will actually have more of a chance to create wild success IF they are properly prepared - mentally, strategically and financially. There are some who have a burning desire to start their own freight brokerage but they don't have the start up costs (less than $3,000 in many cases including training) and they don't have the capital to carry them until they get established. My heart goes out to them because I know a lot of these people could be wildly successful as well - but right now they are just down on their luck. All I can say is, don't give up your dream. If sudden "tragedy" can strike, so can sudden "opportunity". So, don't give up, and keep on getting prepared. Like the saying of an old car salesman on TV used to be back in my hometown - "Something GOOD is going to happen to you today". He ended every sales pitch with these words and I never forgot them. One of the nice things about freight brokering is the fact that it is a perfect home-based business for those who want or need to stay at home. It does not matter what formal education you have had or from what field you were working in previously. 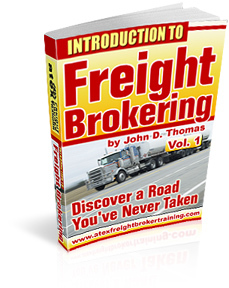 You can learn how to broker freight in about 30 days regardless of where you are coming from. This does NOT mean that it is some type of Mary Kay business. Some of you will know what I am talking about here. Freight brokering is a BUSINESS and a demanding one at that. You have to be serious, you have to have an action plan and you have to have the proper training. Don't kid yourself on this. There are competitors out there ready to "eat you alive".